A Celtic tattoo's meaning can have a broad range depending on the design and its origin. While some characteristics of Celtic tattoos share origins and meanings, there remains a large amount of interpretation for the wearer. 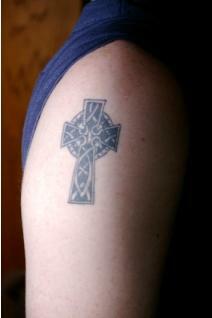 For many, the wearing of a Celtic tattoo is an expression of pride in their heritage. Inspired by the artwork of ancient Celtic illustrations and manuscripts, Celtic tattoo designs can be a way of showing loyalty and spirit to one's ancestry. While the variations on Celtic tattoos can be nearly endless, most Celtic tattoos can be broken down into categories, which have loose meanings applied. Celtic knot work is an ancient art where strands of ink are woven together with no beginning and no end. Each knot can be drawn to take on a different meaning, such as Celtic love knots which symbolize the union of two people, or single strand knots used for meditation. Zoomorphic Celtic knots are a popular form of Celtic Tattoos. Rather than a knot, which continues with no beginning or end, the Zoomorphic knot is broken, with a distinct start and finish. Included in the design, usually at the open ends of the knot are the head or head and other parts of various animals. Zoomorphic Celtic tattoo meanings are thought to bring both the strengths of the animal being represented and the harmony of the knot work. Meanings of Zoomorphic knot work can change by replacing the animal, or by changing the knot work. Interweaving the lines into points or corners for balance, and including the image of a bird can give the meaning of finding freedom through balance in one's life. The image of a tiger on a single broken strand can mean strength or power. As tattoos become more popular amongst mothers wanting to honor the birth of a child, the Celtic motherhood tattoo gains in popularity as well. The Celtic motherhood symbol is made of two hearts, one situated below the other, both encased in a continuous line. Children are added to the tattoo in the form of a dot included inside or outside the knot work, allowing mothers to add to the tattoo with each subsequent child. This tattoo is popular with mothers of Celtic descent, and with mothers who wish to get a tattoo for their children, but do not want an obvious or image based tattoo. A Celtic maze tattoo begins like a knot tattoo, but contains parallel lines running through the knot in the form of a maze. The tattoo can mean clarity, searching, light and being lost and then found. A Celtic spiral contains parallel lines which twist and spiral in a uniform pattern. The spiral can mean eternity, balance, travel and an unending journey into the unknown. Celtic animals, including Celtic butterfly tattoos are another extremely popular style of Celtic tattoo. The image of the animal can include knot work, or other symbolism and can mean nature, elements or take their meaning from the animal itself. Celtic tattoo meanings can also vary tremendously based on what you bring to them. What the design and the tattoo mean to you, the wearer, should be the ultimate deciding factor and meaning of the tattoo. If a design speaks to you but the meaning does not, create your own meaning and fully claim the tattoo design.